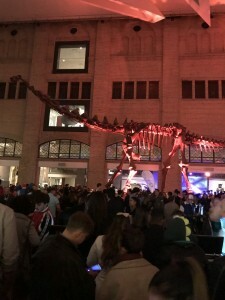 The ROM filled with people for Friday Night at the ROM. It’s no secret to those around me that I love Halloween. I definitely don’t go as all out as a lot of people that I know but it’s up there with my favourite times of year. 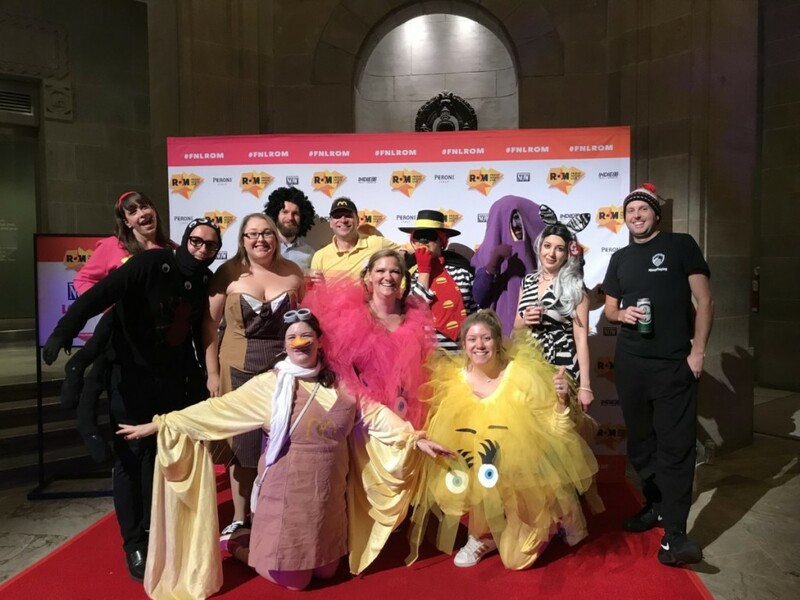 Who doesn’t love getting the chance to dress up as whatever you want and go to parties and other cool things?! I love the whole aesthetic and the chance to just act like a big kid again. I’m a huge wimp so it’s kind of funny that one of my favourite times of year is the spookiest times as well. Even though I’ve been embracing the horror genre for film, I’m still perpetually scared of everything horror that I watch (seriously, I wound up flail slapping my bf this weekend while watching The Haunting of Hill House). My Mabel Pines costume from Friday night. 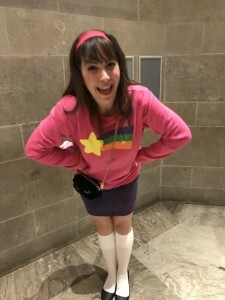 For Friday Night at the ROM, I dressed up as one of my favourite characters from TV: Mabel Pines from the series Gravity Falls. Only a handful of people got my costume but that was honestly okay because I was comfortable and had a blast dancing like a big little kid with my mini stuffed Waddles. Although I was melting in my sweater which seemed like a not-so-great life choice to be dancing around in. On Saturday, my friend Jenn had a house party with a ton of people. She decorated and made her apartment look amazing and had all kinds of tasty treats (and a keg) for us all. It was great to see my friends in a less hectic environment than the night before at the ROM. My Lydia Deetz (a la Beetlejuice: The Animated Series) costume. 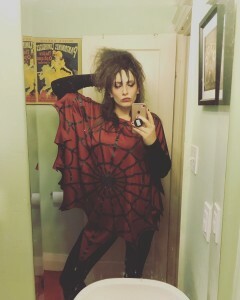 For the party, I decided to dress up as Lydia Deetz, specifically from Beetlejuice: The Animated Series. Only one person at the party got the look (if others got it, they didn’t say anything) and my bf was convinced that I hadn’t done a very good job with my costume (due to thinking I was supposed to be Wednesday Addams…) but this was also an incredibly comfy costume so I didn’t mind. Well, it was comfy except for my hair which was essentially a big mess since I teased the crap out of it to make it stand up like Lydia’s hair does. I stuck around with my friend’s there until one of the guys started a drinking game. As someone who has really minimized my drinking in 2018, this was when I knew I had to step out. My bf doesn’t drink either so it definitely felt like our time to leave. I AM TOO OLD FOR DRINKING GAMES. Sunday was spent watching The Haunting of Hill House (and accidentally slapping my bf…) as well as carving pumpkins. I didn’t get great pictures of any of the pumpkins I did but it was a lot of fun to do. Plus roasting pumpkin seeds and munching on those is always a delicious treat – although I kind of botched mine because I didn’t let them dry out first. I have NO CHILL and wanted pumpkin seeds IMMEDIATELY. Halloweekend was a great time and I still have a few more things to do for the remainder of October to celebrate Halloween which is exciting. All I want to do right now (for the most part) is sleep but HALLOWEEN ONLY COMES ONCE A YEAR so here we are.